The deadline for entries is August 18, 2018. In order to have the lineup completed and your position in the parade mailed in time, entries will not be accepted after the deadline of August 18, 2018. The 2018 Marion Popcorn Festival All-Pageant Informational Meeting will be held Saturday, June 23, 2018 at bluefusion Fun Center, 1340 Mt. Vernon Avenue, Marion from 2:00 p.m. until 4:00 p.m.
Thursday September 7th Savage Anarchy Wrestling brings Live Pro Wrestling to the Marion Popcorn Festival. S.A.W is known for their support of family entertainment aspects when putting on a show. 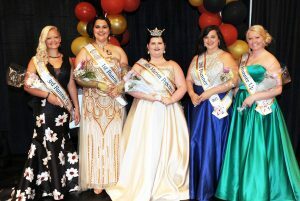 (L – R): 3rd Runner- Raeleigh Richards, 1st Runner-Up Annslea Schaber, Miss Marion Popcorn 2017 Kaylee Wallace, 2nd Runner-Up Emily Christman, and 4th Runner-Up Ashley Keener. Kaylee Wallace captured the title of Miss Marion Popcorn Festival 2017 Saturday evening, August 5, during competition at River Valley High School. By winning the Miss Marion Popcorn Festival title, Wallace earned a $1,000 scholarship, as well as the Festival crown, banner, and a prize package. 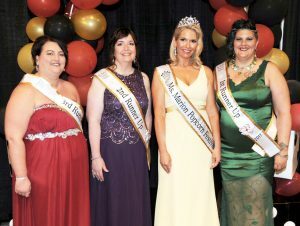 (L – R) 3rd Runner- Jennifer Martin, 2nd Runner-Up Steffany Loper, Ms. Marion Popcorn 2017 Michelle Maynard, and 1st Runner-Up Josette Schaber. Michelle Maynard of Galena, Ohio was named Ms. Marion Popcorn Festival 2017 during popcorn royalty festivities Saturday evening, August 5th, at River Valley High School. She won a cash award, a crown, banner and prize package. “I am so excited to represent the Popcorn Festival and the Marion Community and look forward to the activities of the upcoming year” said the new Ms Marion Popcorn Festival, Michelle Maynard.